An Excellent, hassle-free solution for cyclists who desire an effective way to see what's behind them. 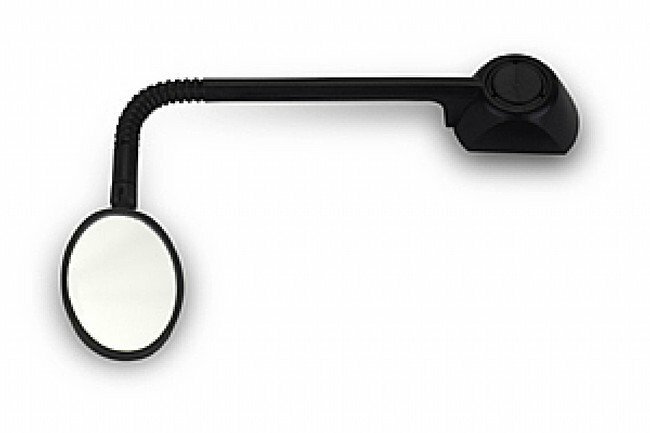 The Kraton covered wire makes Reflex a flexible and fully adjustable helmet mirror. 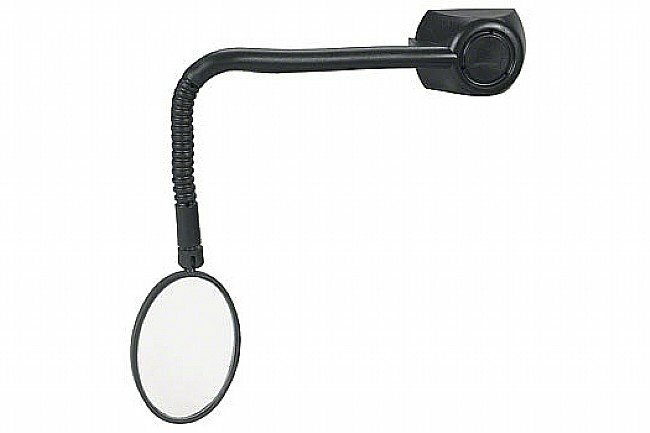 Reflex mounts with a ball-and-socket arrangement so you can effortlessly find the best viewing angle. The small base that sticks permanently onto any helmet. The mirror is detachable from the base and also has a rotating arm. 22 grams. The best mirror I have ever used. I bike 50-75 miles a day in all sorts of traffic and weather conditions. This is the second of these I have had they fit great on my Giro helmets. I have had other mirrors over the years and they tend to fade over time and need to be replaced. I have one these that is just like the day I bought it and is over 15 years old and still in use. I just recently bought a new helmet and added one of these to it. Light and the perfect size. This is the best mirror I have tried. It is the perfect size to give you a heads up on your rear and still be invisible when looking forward. The flexible section can hold some pretty weird shapes without slowly rebounding overtime. I wish I could attach it with a zip tie to help keep it on my helmet. I fell and the sticky base popped off my helmet, unfortunately the sticky pad seemed to reattach just fine, then began falling off during my ride. I lost it somewhere in Sardinia, but up until then I have never had a better mirror. I will certainly purchase another one when I can. Best Miror Out there !!!! !Have used many !!!!! Hands down,,this is the best out there !!!! Do not get on the bike without it.In my late 60s and the neck is no longer like an owl.Mount it securely and just tweak as needed.Always good to know what is going on behind you! I bought one of these several years ago, and in a short time decided it was indispensable. I have since bought several of them, and installed on different helmets. I absolutely avoid riding without some kind of mirror, and this one suits me fine: adjustable, out of the way, and gives a panoramic view (since its mounted to the helmet). I don't see what is not to like about this mirror -with the major exception of the sticky base. Read on. Now for the con: The sticky stuff for the mount doesn't last, and sometimes fails (peels off incorrectly) right out of the box. So you will need some good glue, or (I recommend) some epoxy cement. Once you get the base cemented, you'll have no further trouble. I like this Mirror. I feel a lot safer to be able to see incoming traffic from back when I am riding my bike on the road. Craning your neck to see what's behind you can throw off one's balance a lot more than you may think...UNTIL you wipe out from doing so. Having full S.A. (Situational Awareness) of surroundings at all times is crucial for me. This product fills a niche part of a cyclists' surroundings ... what's behind you! Again, after my initial getting used to it, i've never ridden without it since - but note, I do NOT use this during competition...the closed course detail ensures I don't have a killer automobile on my backside with bad intent(s). A great mirror, and now with replaceable parts. This mounts to my helmet so it is always with me when I am riding. The clip on type got left at home occasionally. I would prefer if the mirror was slightly larger. I think there are larger ones in the company's catalog, but this vendor doesn't carry all the options. I have it stuck to my helmet's visor. Seems stuck on pretty good. I've only used it for a month or so, but it seems like it will stay on for the forseeable future. Overall it works ok, and you can see what's coming up behind you. That's the main thing. I have always had a helmet mirror. The base for this one actually sticks as it should, and well enough that you can snap the mirror off the base so you can safely store the helmet. The mirror is easily adjusted and has not fatigued in 2 years. I did have to reglue the base after months. Doesn't fit all helmets...requires some fiddling to get it right. It works well enough, but like all mirrors, if it's not connected to you (glasses) then it shakes. I think I prefer the glasses attached mirrors. Love the virror. Don't have the SLIGHTEST idea how to mount it on my new helmet. I used this mirror for at least 6 years, maybe 8. I broke one or two, but it was definitely worth replacing with the same. In order to mount it on my old helmet, I shaved a little bit of the styro off to give me a FLAT surface for mounting. The new helmet just doesn't have enough styro to meet the diameter of the mount. I sure wish it did. I LOVE this mirror. I have a very creative mind Upon occasion, from having moved the little mirror around and re-angling it and doing so again & again so many times, it would be loose and not stay in position. I did not want to use glue, as then I wouldn't be able to adjust it any more at all. So...how did I solve the problem? I thought about it, and it became so easy! Take some nail polish and put a single coat on the ball of the mirror. Wait for at least 5-15 minutes, or until you know that it's completely dry, and snap it back into the socket. You now have a nice secure mirror which is going to stay in place! In fact, for a slight period of time, it is actually going to be a bit tight to move around..which is a PLUS. Also, after a while, if the base comes off, you can re-secure it with super glue. I did, and it worked well. If anybody has the slightest idea how I can mount this mirror where there isn't very much styro on the side, and the way the vents are, also with almost NO flat surface space for mounting it, does anyone have any suggestions? I thought about possibly mounting it on the visor. Have to re-evaluate that. I just got my newest bike and helmet 3 days ago. Wow!! Never had a bike so great, carbon frame and all, so light! Haven't ridden for 2 years as I was in a hit 'n' run and ended up in a bunch of pieces! Retired because of age, but more because I really couldn't return & do my usual...cooking, not cheffing..big difference. If anybody has some suggestions for mounting the mirror, please send it my way. 1 of 3 customers found this review helpful. Fell apart on me on a ride. Pay a bit more money and get a good one. Where I ride it is important to see rear traffic approaching. This mirror, when it stayed on the helmet was OK. I think there may be better mirrors available. Excellent safety item, helps you anticipate traffic much more easily. Pops off if you don't want it. 9 of 11 customers found this review helpful. I've been using one of these mirrors on pretty much every ride I do for over 2 years. You can't tell from the picture, but there are three major pieces in the mirror assembly - the mirror and plastic holder, which has a little ball on the end, a flexible arm with a socket on one end for the mirror and a socket on the other, and the helmet mount. 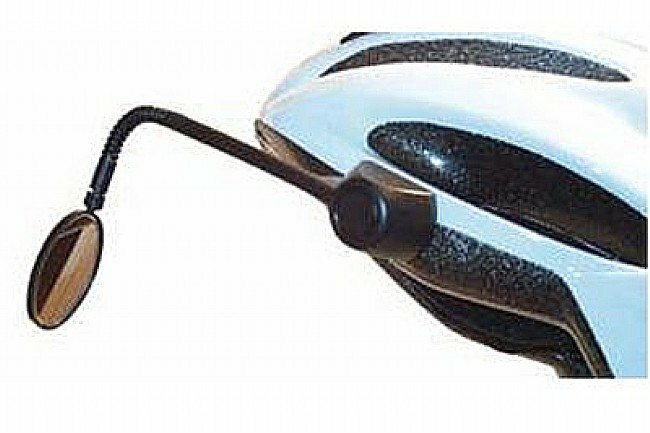 The helmet mount is attached to your helmet with double sided tape. The arm pops off of the helmet mount with ease. You can also rotate the arm along one axis while it is in the mount, and you can rotate the mirror itself in any direction. What does this mean? If you are riding along and the sun is suddenly directly behind you in the mirror, you can just rotate the arm at it's base, and the mirror (and sun, or whatever) is no longer blinding you. You can adjust the mirror itself while riding, but it is a bit tricky to get right until you've gotten used to it. At first it does take a bit of adaptation to use the mirror effectively (I suspect this applies to any helmet mirror), but once you get used to it and have it positioned in the right placeat the right angle, it works extremely well. If I've been doing a lot of bike riding, and I'm just walking around doing something later near a road, I might actually feel confused that I can't see behind me. Once you are used to having it, being without it is like driving without mirrors. Who would do that? Because I have this mirror, I can very fluidly move in and out of traffic when I need to avoid an obstacle blocking the bike lane, when I need to find a gap in traffic to move to the left to turn, etc. It's also helpful when waiting at an intersection for the light to change. If I see a car coming up behind me in my mirror, I can get out of the way to allow them to turn right. When riding along I can see if there is a car behind me waiting to turn right and move to the left to give it room. I can see if there is a big truck coming up behind me. Basically, I don't have to look over my shoulder very much, and I know what is going on behind me a lot better than someone who would have to look over their shoulder to see anything. I used it when riding along the freeway with a large group of other riders as part of a charity ride. This allowed me to warn the other people around me when there was a vehicle about to pass us, so that they could be prepared for the gust of wind and not be startled. It also comes in handy in a pinch. Once I got a bug in my eye when I was riding. I popped off my helmet mirror and used it to look at my eye, allowing me to easily pull out the bug. You can also use it to fix your helmet hair before that important meeting (or hot date? ).